All rooms have a private bathroom and a satellite TV. Free Wi-Fi is available in the entire building. 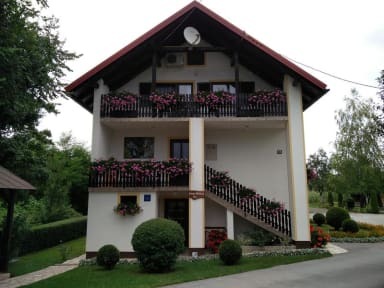 House Pavlic - 3 rooms and one apartment are a part of family house. Apartment is with separate entrance, LCD SAT TV, living room, one room with 3 beds, equipped kitchen and bathroom, private terrace. Rooms are with separate entrance, each room is with 3 beds, possibility of using common kitchen, SAT TV, central heating, suitable for wheels. Outside barbecue, parking lot (free of charge), free Wifi, children playground. Nearby is a horse farm for those who love riding. Nearby is a restaurant with great catering offer. We accept Croatian Kuna and Euro if you are paying in cash. Pets are allowed and free of charge.